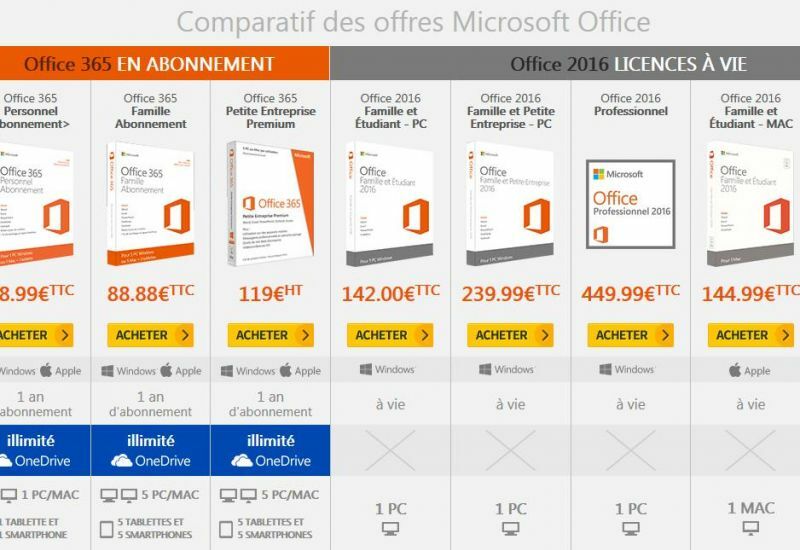 To get a clearer picture of Microsoft's different offers for its Office products, we have prepared a complete comparative table, which includes all the components, prices and licenses for each product. This table is divided into two parts, one focusing only on the different iterations of Microsoft Office 365, the other on Office 2016, Mac or PC versions. Of course, the information provided here is for information purposes only and may change at any time. The prices indicated were retrieved from the Microsoft Product Store Download in October 2015. They are subject to change and may include temporary promotional offers. Finally, please note that to try Office 2016 or Office 365, you must create a Microsoft account and request a one-month Office 365 trial version, which will not be charged.